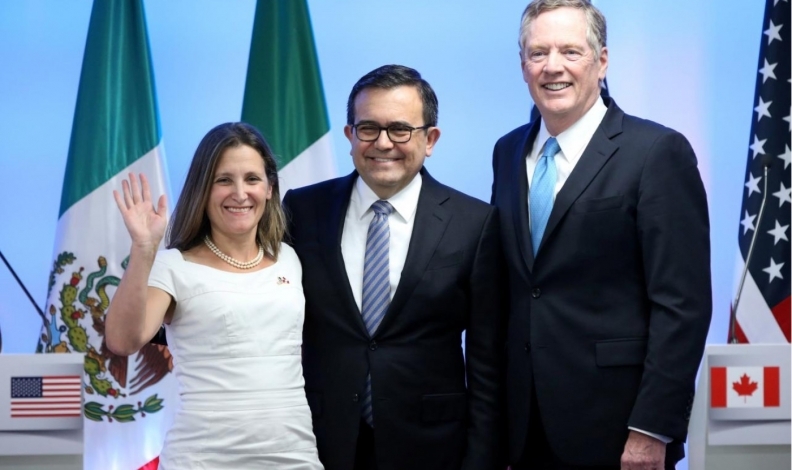 Canadian Foreign Minister Chrystia Freeland, Mexico's Economy Minister Ildefonso Guajardo and U.S. Trade Representative Robert Lighthizer pose for a photo after addressing the media to close the second round of NAFTA talks. OTTAWA -- The United States is expected to clarify its demand for more stringent rules of origin in the auto industry during the next round of NAFTA talks, scheduled to start Sept. 23 in Ottawa. That explains why Foreign Affairs Minister Chrystia Freeland is meeting with a roundtable of auto parts manufacturers on Friday and also having lunch with former Prime Minister Brian Mulroney and his team who negotiated the original Canada-U.S. free trade agreement. Currently, NAFTA stipulates that vehicles must have at least 62.5 per cent North American content to qualify for tariff-free passage across the three countries' borders. It's not clear so far whether the United States is looking to require a minimum amount of American content or whether it will insist on more stringent tracing of the origin of raw materials, particularly steel, that go into automobiles. Such questions are among the "fundamental issues of principle" that have to be confronted "sooner rather than later," said Alden. In order to meet the year-end deadline Canada, Mexico and the United States would like to meet, experts say negotiators will likely have to settle for agreement in broad principle on some of the contentious areas, with details to be worked out later. That’s because NAFTA negotiators appear to have adopted the lament of Alice in Wonderland’s White Rabbit: "The hurrier I go, the behinder I get." Battalions of negotiators for Canada, Mexico and the United States have been working at a breakneck pace trying to reach agreement on a revamped North American Free Trade Agreement by the end of the year, but so far they have little to show for it. "Yeah, well, we're moving at warp speed but we don't know whether we're going to get to a conclusion, that's the problem," he told the Center for Strategic and International Studies in Washington. "We're running very quickly somewhere." Canadian government officials insist the talks are going well and it's premature to conclude they're running off the rails. But trade experts and stakeholders who've been following the negotiations closely say they've seen no progress on any of the thorny issues and no discernible headway, even on the simple things where all three countries should be in agreement. If there's no significant progress during the third round of negotiations, starting Saturday in Ottawa, they say there's no chance a deal can be struck by year's end. And if there is no deal early in the new year, some experts predict U.S. President Donald Trump will follow through on his threat to pull the plug on NAFTA rather than go empty-handed into primaries for mid-term congressional elections. Ohio-based trade lawyer Dan Ujczo said he's been surprised that all the supposedly "low-hanging fruit" — issues that weren't considered controversial, like bringing the pre-internet NAFTA into the digital age — is still hanging. "If we don't see something like the digital chapter ... some very strong, completed text on that emerge by the end of this third round, I'd say that's a very strong signal that we're not going to get this done." Ujczo noted that the U.S. political calendar will become "extraordinarily tricky" early next year, with primaries for the mid-term elections starting in earnest in March. Trump was elected on a promise to rewrite or rip up NAFTA and Ujczo said he has to deliver on that, one way or the other. "We have a president who has not demonstrated a great deal of patience on other issues so I think a process that continues to drag on into 2018 will increase the likelihood that the president issues a withdrawal from the NAFTA." Ted Alden, senior fellow at the Washington-based Center on Foreign Relations, agreed. "I think it is important that we begin to see real engagement on some of the difficult issues," he said. "I think the sooner that happens, the better likelihood of a positive outcome. All that seems to have happened so far is they're sort of (saying), 'Here are the areas where we can check off the boxes' and they haven't even done that many of those." Ottawa-based international trade strategist Peter Clark, who was involved in the original NAFTA and Canada-U.S. free trade negotiations, said he expects to see "some visible progress" out of the Ottawa round. "I think there has to be because you can't keep on going and not doing anything. You have to have enough progress to keep Trump from pulling the trigger," said Clark. Those expectations are certain to be dashed, however. Canadian government officials, speaking on background, bluntly say there'll be no breakthroughs on the big, outstanding issues during the five days negotiators are in Ottawa. Rather, they'll continue what they started at the first two rounds: exchanging draft texts on different issues and assessing areas where quick agreement can be found. Indeed, they don't expect progress on the controversial issues — such as the dispute settlement mechanism, investor state dispute settlement, rules of origin, labour standards and labour mobility, supply management — until the very end of the negotiating process in December. They contend it's in no country's interests to start making concessions at this early stage of the game. Canadian officials also say progress has in fact been made on the non-controversial issues, including the digital chapter, although they concede the tough files have yet to be broached in a serious way. Indeed, the United States has not even provided text spelling out its position in at least two contentious areas: rules of origin and agriculture.